The latest issue of HSE Update is now out and ready for download. 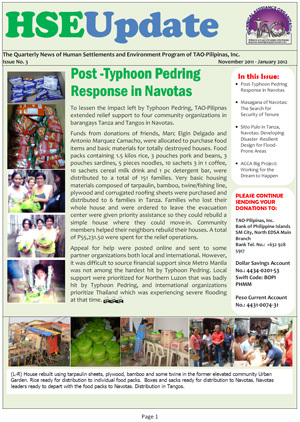 For this issue, an update is given on Post-Typhoon Pedring Response. An article written by MASAGANA PO Leaders is also featured. The article talks about their search for security of tenure for their community. The issue also tackles other technical assistance projects done by TAO-Pilipinas through the HSE Program. To download HSE Update Issue 3 just click on the picture. This entry was posted in Press Release and tagged ACCA Navotas Network, HSE Update, MASAGANA, Navotas, Sitio Pulo. Bookmark the permalink.